Happy New Year! One of my goals for this year is to eliminate as much processed food as possible and this salad is a great start. I made it for lunch on Christmas Day and it was so good! It’s a nice break from all the heavy food usually adorning our dinner table, plus it takes delicious. It’s a quick and easy salad to make. I had everything prepped and ready to take to my mom’s, where I made the dressing. 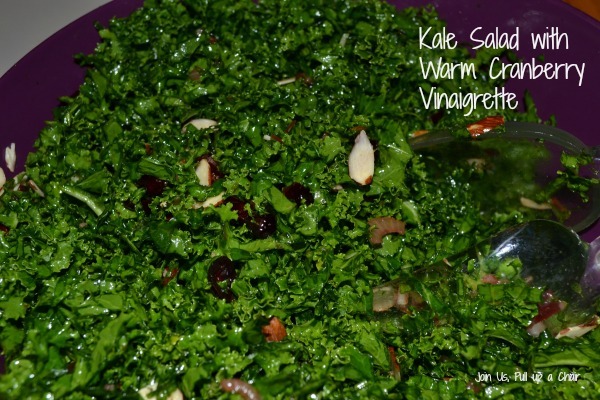 A tip when you make this salad it to massage the kale helps to take it from bitter and tough to sweet and silky. It’s super easy and takes about five minutes. You’ll notice the texture changes and it becomes darker green. In a large bowl, massage the kale with one tablespoon of olive oil and salt for a few minutes until it becomes tender. Set aside. In a large saute pan, heat two tablespoons of olive oil over medium-high heat. Add in the shallots and saute for five minutes or until tender and cooked through. Saute the garlic for one minute and then add in the cranberries, red wine vinegar, honey, lemon juice and zest. Stir to combine and turn off the heat. Season with salt and pepper. Pour the dressing over the prepared kale and top with the almonds. It would be great to throw in a few crumbles of blue cheese.